MODERN 2 storey, 2 bed/ 2.5 bath Garrison Woods home features over 1550 dev sq.ft with sunny SOUTH back yard, dble garage on a dead-end street. The floor plan is bright & open featuring HARDWOOD FLRS THROUGHOUT, cozy GAS FIREPLACE in the LR & a formal dining. The chef’s kitchen features crisp white cabinets, under counter lighting, sleek concrete counters, island with sink, counter top stove with wall oven & chimney style hood fan. The Master bedroom is large with a walk-in closet & 3-pc EN-SUITE. The 2nd level also includes another bedroom, loft and full bathroom. The lower level is fully developed boasting a spacious family room, laundry w/front loading machines, storage & mechanical, 3rd bedroom could easily be added. 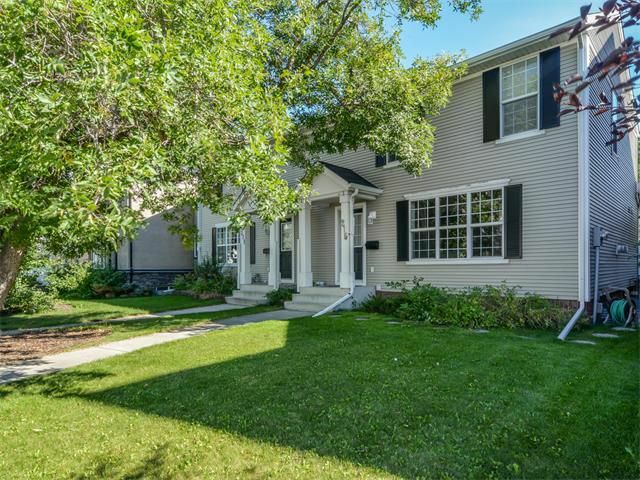 This home comes complete w/double detached garage (insulated & dry-walled), freshly painted interior, paved alley & private landscaped yard with mature trees. Close to all levels of schools, parks, Garrison & Currie shopping areas & 5 minutes to DT!